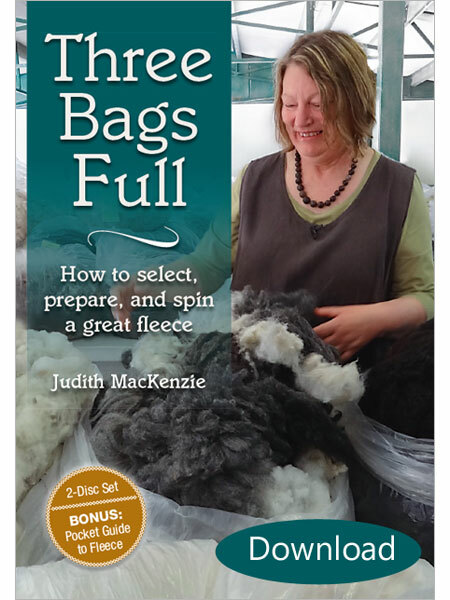 Choosing a good fleece for handspinning can be tricky for a beginner. Many breeders are willing to sell you their fleeces, in some cases, even give it away. But not all fleeces are suitable for handspinning, and you may lose your enthusiasm for handspinning raw fleece if your first fleece is a bad one. I feel it is best to buy a fleece that has been just sheared, because the grease in wool will still be soft. If you are gifted or purchase a fleece that has been sitting around for awhile, the grease may be hardened, making it more difficult to clean. Select a fleece with a staple length of at least 4 inches long. Be sure to examine the whole fleece, in case the Shearer has wrapped the fleece to conceal shorter undesirable fibers in another section. Avoid fleeces with an excessive amount of "second cuts". These are very short fibers created by shearers when they don't shear close enough to the skin the first time, and they go back and give the same section a second cut. Examine the fleece for vegetable matter, dirt and debris. If it is full of burrs, hay, and dirt, you will have to clean all of this by hand yourself, in order to prepare it for handspinning. Try to purchase a fleece that has already been skirted, which means having the vegetable matter already removed. Watch out for stains in the fleece, particularly yellow stains. 1. Fill the washer with very hot water. Add liquid detergent about a cup. Turn off the washer. Gently put your fleece in the washer tub. Close the lid and let the fleece soak for about 45 minutes. 2. Next, turn washer to the end of the SPIN cycle. Spin the water out of fleece. Lift the fleece out and set it aside. 3. Fill the washer tub with very hot water again. Put the fleece back in and let soak for about 30 minutes. 4. Turn washer to the end of the SPIN cycle. Spin the water out of the fleece. At this point, sort out the fleece that is clean enough to dry. If fleece is especially fine or dirty, you may need to repeat the wash and spin steps a few more times. Mohair often needs multiple washes as does merino, rambouillet and sometimes other finer wools. Use hot water with about one-half cup of white vinegar and soak fleece 30 minutes for the last rinse, then spin it out. Spread the fleece to air dry on a towel or drying rack. Using very hot water and the same amount of detergent as above, follow pretty much the same steps as for the washer method. Do not allow running water to run directly on the fleece. A nylon mesh laundry bag can be used to help contain the fleece for lifting but the more open the fleece can be in the water, the cleaner you can get it in fewer wash and rinse sequences. Any liquid detergent, without bleach should work fine. However, avoid using products with conditioners, because they can leave a filmy residue on fiber which will impede the carding process. To prevent the fleece from felting, avoid the urge to knead the fleece or handle it excessively when it is in the water. Also between rinses be sure to fill the next tub of water at the same water temperature you are taking the fleece from. Gently squeeze out the water from the fleece and spread it to air dry on a towel or drying rack.